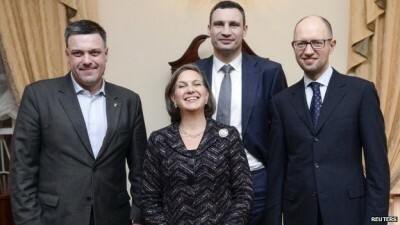 On March 4, Nuland addressed House Foreign Affairs Committee members. Fact: Washington wants Ukraine used as a dagger against Russia’s heartland – with menacing US bases on its borders threatening is sovereign independence. Fact: US-deposed President Viktor Yanukovych’s police showed remarkable restraint. Fact: Washington-supported Nazi thugs bore full responsibility for beatings, sniper killings and other violence. Fact: Ukrainian parliamentary and presidential elections were farcical – with no legitimacy whatever. Fact: So-called economic reforms involve crushing hardships on already impoverished Ukrainians in return for loan-shark-of-last-resort IMF blood money. Fact: No responsible political reforms exist. None are planned. It bears repeating. Ukraine is a US-installed fascist dictatorship. Ukrainian banking is a black hole of grand theft. State farmland and enterprises are being sold to Western predators at fire sale prices. Corruption is worse than ever. Government and military officials are stealing everything they can get their dirty hands on – at the expense of imposing crushing austerity on deeply impoverished millions. Hyperinflation grips the country. The “breadbasket” of Europe can’t feed its people. Rationing was imposed. Energy prices skyrocketed to unaffordable levels. Ukraine symbolizes humanitarian disastrous conditions wherever America shows up. Claiming it’s “building a peaceful, democratic, independent” nation is polar opposite truth. She aimed the worst of her rant at Russia and Donbass freedom fighters. She lied about Crimea “under illegal occupation” – ignoring near Crimean unanimity to reverse a historic mistake and rejoin Russia. Fact: Kiev collaboratively with Washington launched naked aggression against Donbass residents wanting democratic rights everyone deserves – wanting to live free from the scourge of fascism. Fact: No Russian hoards “poured across (Ukraine’s) border.” Kiev’s own military chief said so. No evidence whatever shows Russian involvement. None exists except photos exposed as fakes. Fact: Washington and Kiev bear full responsibility for unleashing unspeakable violence against Donbass residents. Fact: One or more Ukrainian warplanes downed MH17- a US/Kiev false flag. Russia and rebels had nothing to do with it. Fact: Russia is the only nation delivering vitally needed humanitarian aid – inspected by ICRC representatives. Fact: Minsk ceasefire terms included nothing about Debastseve. Fact: Washington and Kiev “manufactured” Donbass’ conflict – not Moscow or rebels. Not a single House Foreign Affairs Committee member challenged Nuland’s obvious and outrageous Big Lies. They accepted them as gospel. They let an unindicted war criminal insult them. Russia and rebels are consistently and wrongfully blamed for US/Kiev crimes. Obama wants war, not peace. He wants unchallenged control over America’s newest colony. He wants it pillaged for profit. He wants it as a stepping-stone toward long sought regime change in Russia – replacing its sovereign independence with pro-Western puppet governance.